We went to Wilson Lake over the weekend. This lake is called “The Clearest Lake in Kansas” because most of the area that drains into the lake is covered with rocks and prairie rather than tilled farmground. 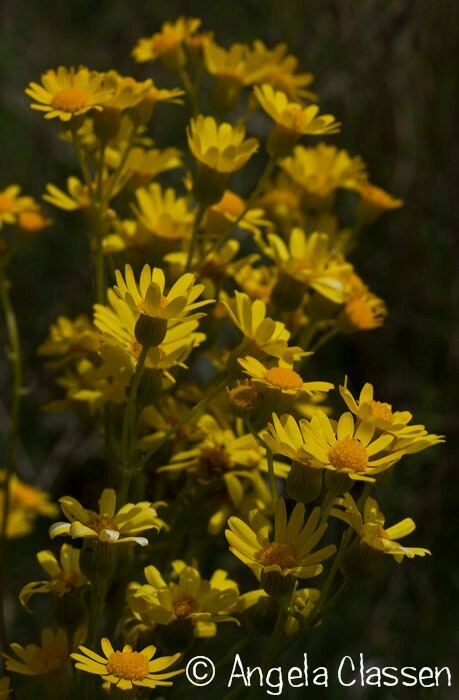 While my husband biked the awesome trails there, I hiked and looked for wildflowers. The first 10 minutes of my hike, I thought “Wow, there’s just not a lot blooming yet.” But then I slowed down a bit and started to really look, and discovered blooms were there. My hike started at the Hell Creek Bridge and went south and west, following the contour of the lake up on the ridges above. Let me tell you, if you still think Kansas is flat, you need to go to Wilson Lake, and you will change your mind quickly! Wilson Lake sits smack dab in the middle of the Smoky Hills of north central Kansas. 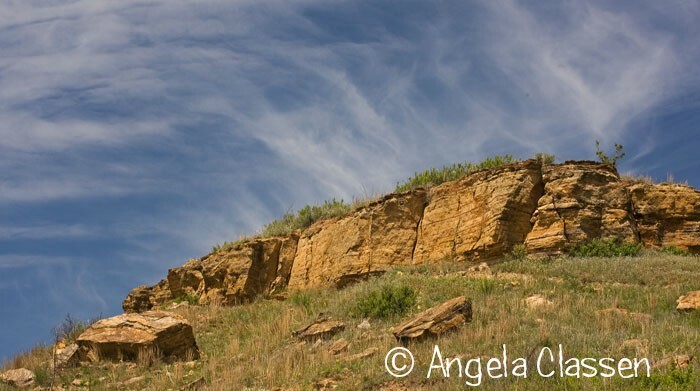 The Smoky Hills are comprised of three types of rock: Niobrara chalk, Dakota sandstone and greenhorn limestone. 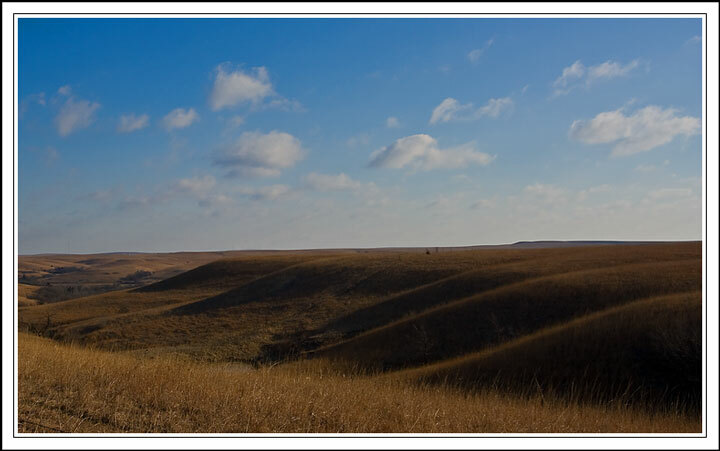 The hills are covered with a thin layer of dirt with a mixed grass prairie growing on top. 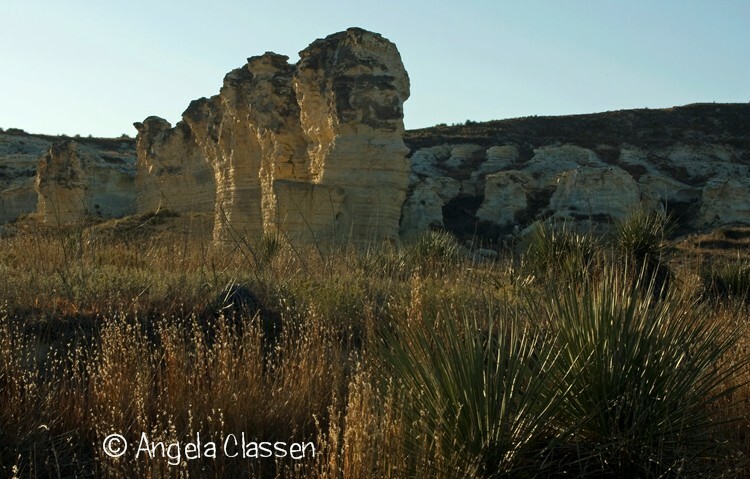 Some fascinating rock formations exist in the Smoky Hills area. Rock City is near Minneapolis and is an odd collection of sandstone concretions. Mushroom Rock State Park contains sandstone pedestals (mushrooms). The neighboring Kanopolis Lake contains great sandstone bluffs and caves. Wilson Lake also has an area called the Rocktown Natural Area which contains some 15-20 foot tall sandstone spires, but I didn’t have time to visit this time out. 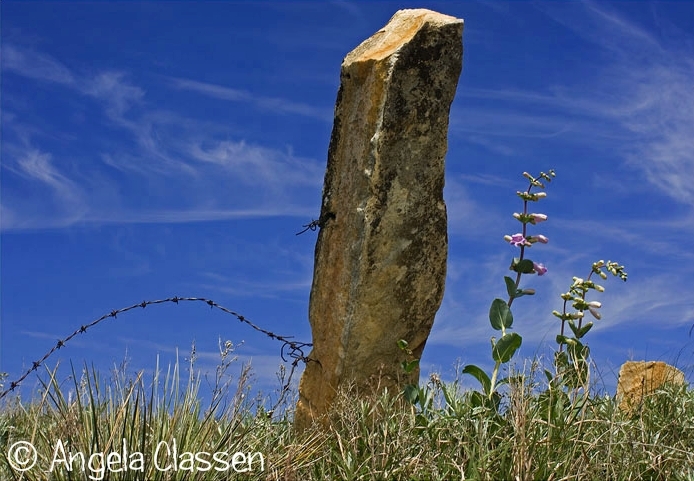 The area is nicknamed “Post Rock Country” because when the pioneers arrived, there wasn’t much timber in the area and they used what was readily at hand – greenhorn limestone rock. These old post rocks now make great photographic subjects, and there’s quite a few of them at the lake, the trails strategically placed so as to enjoy them. I ran into another mountain biker (the self-designated “trail natzi”) who apparently is also a wildflower enthusiast. He does a lot of volunteer work on the trails, and he seemed excited I was taking photos of the local wildflowers and was more than happy to identify them for me. 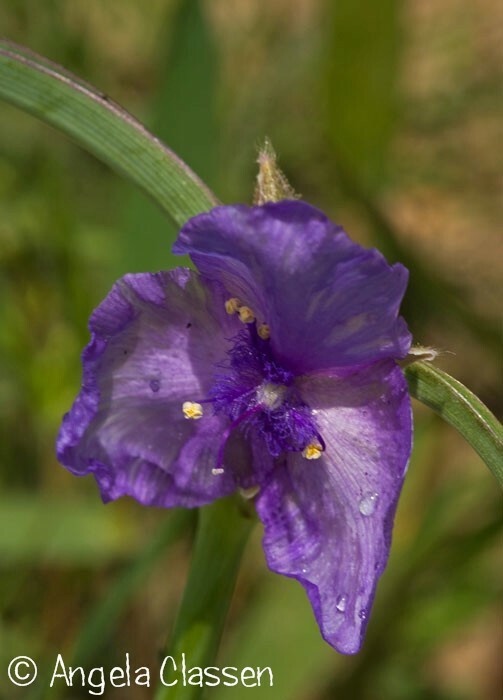 When I got home, I looked them up in my “Wildflowers & Grasses of Kansas” book by Michael John Haddock and found out he was 100% correct in his identifications. 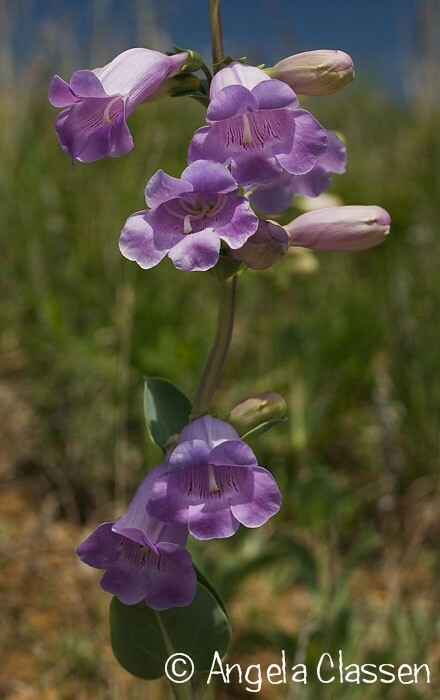 My favorite was the Cobaea penstemon. They remind me of a foxglove. 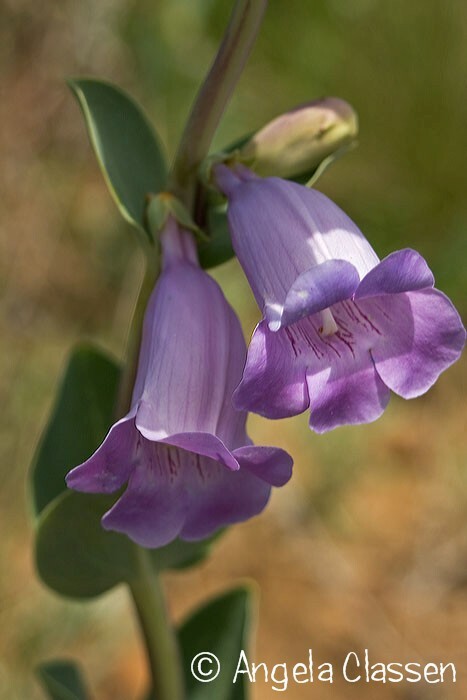 I remember seeing bunches of the penstemon blooming last year when we visited the lake, but during the first part of my hike, I didn’t see any. Later on, however, I was rewarded! 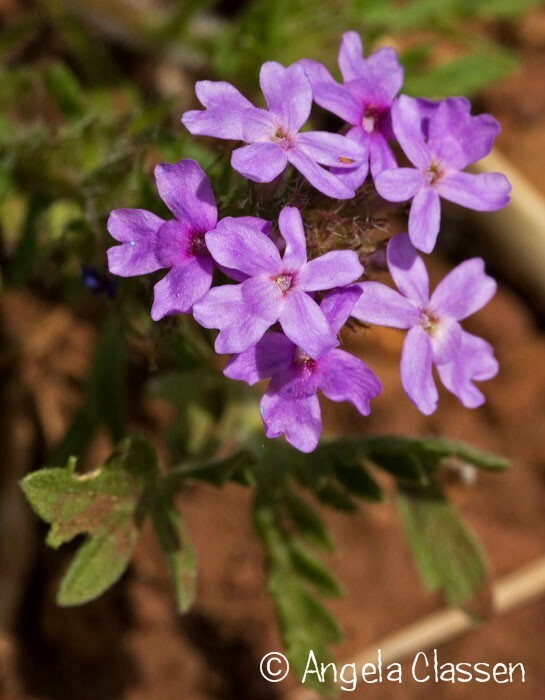 There were scads of them blooming on top of the ridges, perched among the sandstone rocks on the hillsides. 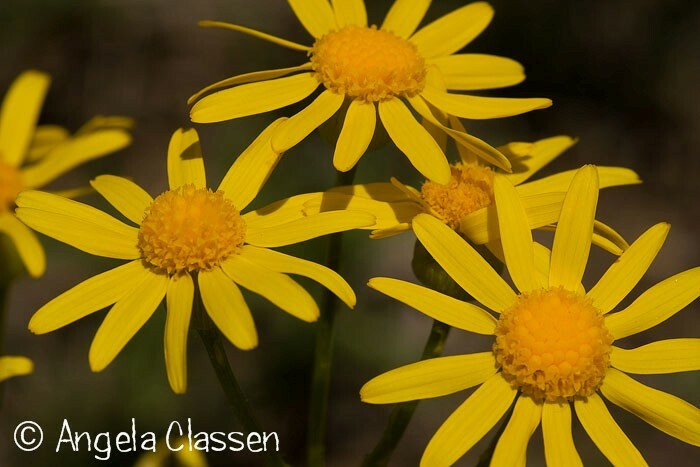 I had fun scrambling up the hillsides to find good clumps of blooms. 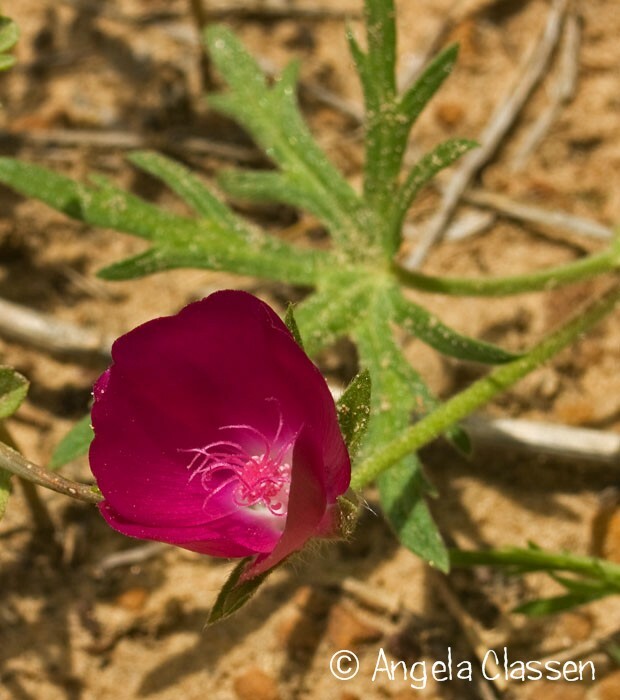 Other wildflowers blooming were wild onion, spiderwort, Dakota verbena, prairie ragwort, western wallflower and purple poppy mallow (which I’ve always called “cowboy rose”). 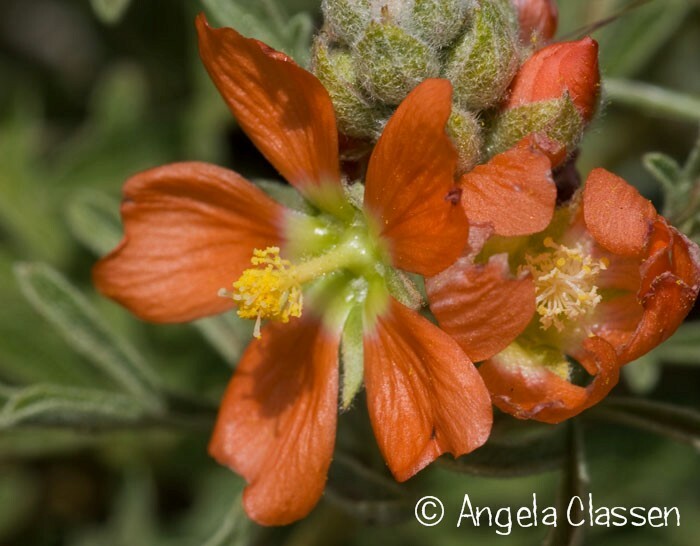 Also in a few spots I found some scarlet globe mallow, which is similar in appearance to a globe mallow that blooms in the Southwest, but much shorter. 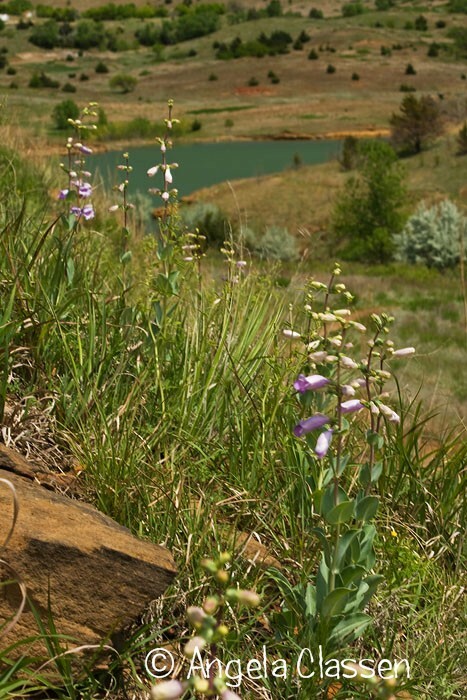 You can read more about the interesting history of the Smoky Hills and Wilson Lake area by clicking here. Nothing irks me more than to hear people say “Kansas is flat and doesn’t have any interesting scenery.” This assumption is totally wrong! Yes, there are areas of Kansas that are flat. The area around Hutchison is flat, and some areas of southwest Kansas near Liberal are very flat, hence the truckdriver’s nickname for Liberal: Pancake City (well, that’s also because of the famed Pancake Race each year between Liberal and Olney, England). Eastern Kansas has the famed Flint Hills. Southeastern Kansas has “mounds” and other steep hills. North Central Kansas is home to the Smoky Hills. 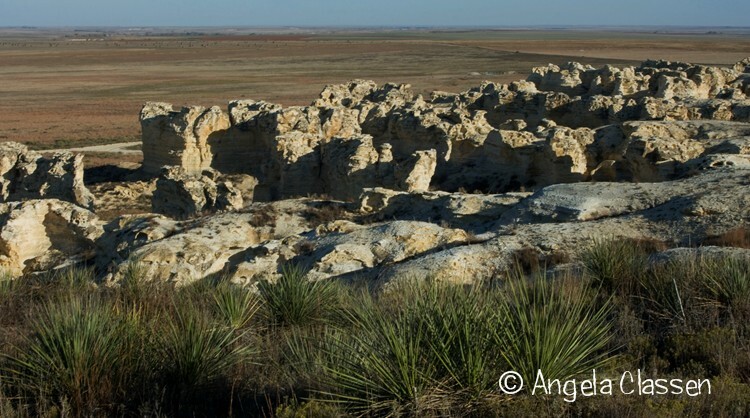 There are also rugged, hilly areas in western and southwestern Kansas as well: near the Lake Scott area, the Gyp Hills which stretch out to near Ashland, the Arikaree Breaks in Cheyenne Co., and the Castle Rock/Badlands area in Gove Co. to name a few. Are these areas right off the interstate for everyone to see as they whiz by at 80 mph? No! You have to actually get on some backroads and slow down to enjoy. If people would just do this, their eyes would be opened to the varied, beautiful scenery Kansas has to offer! 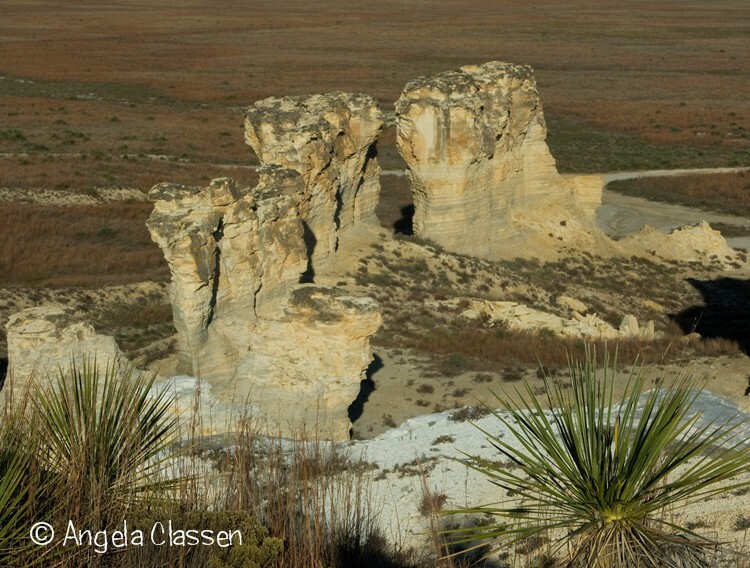 Gove Co. in northwestern Kansas is chock full of chalk formations and rugged canyons. Many are on private land and not accessible to the public, but they are there. 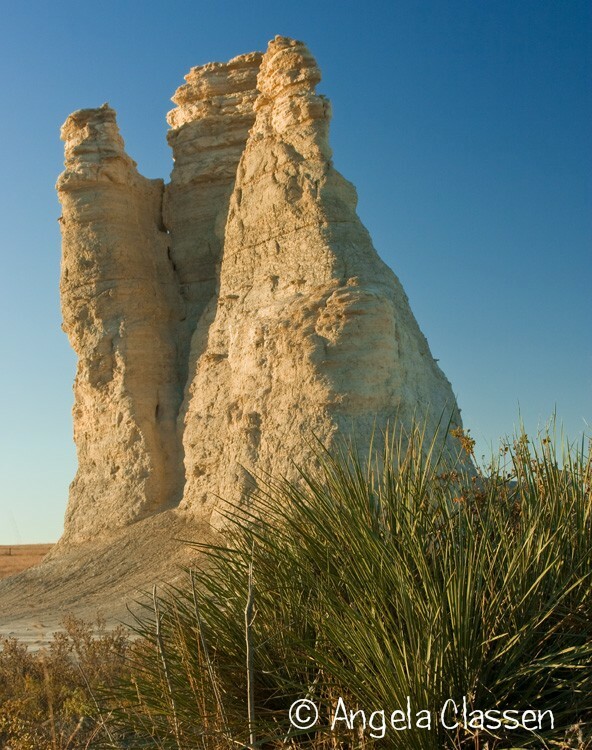 Fortunately, the most impressive of these formations are free and open to the public: Monument Rocks and Castle Rock. 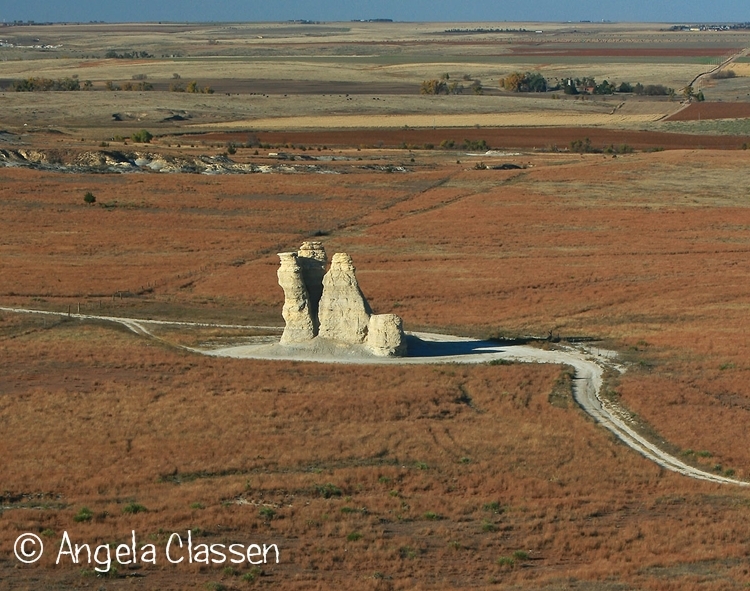 This post will discuss the Castle Rock area, which was named jointly with Monument Rocks as one of the 8 Wonders of Kansas by the Kansas Sampler Foundation. To reach the Castle Rock/Badlands area, exit from I-70 at the Quinter exit (exit 107), go south 15 miles to the intersection of GO 80 & GOK, then 4 miles east to the Castle Rock sign, then turn north and cross a cattle guard. 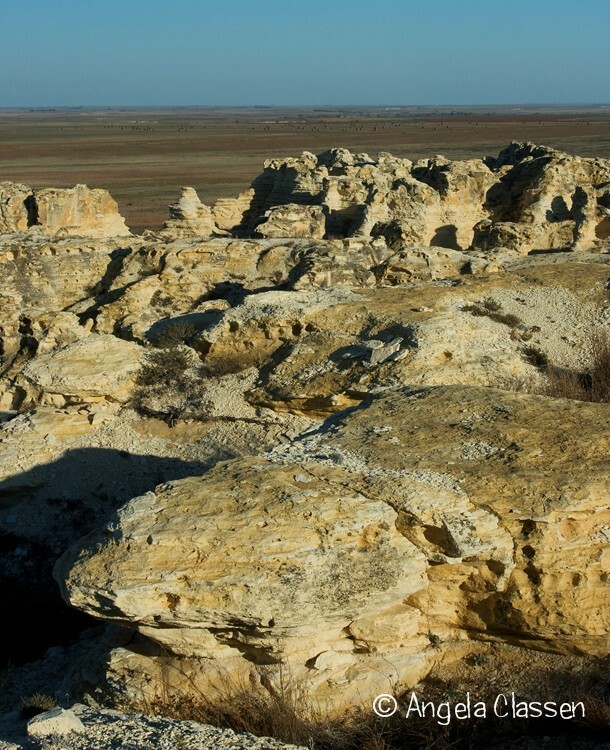 Several rutty roads allow you access to the bluff overlooking the badlands, and circle downward, allowing you up-close exploration of the funky rock formations. If driving a car, be very careful as some of the ruts are fairly deep. Regular and 4WD pickups will have no trouble negotiating the roads. The Castle Rock formation is down in the Hackberry Creek Valley, all by its lonesome. It remains a mystery why all the rock between it and the bluffs to the west and south eroded away. 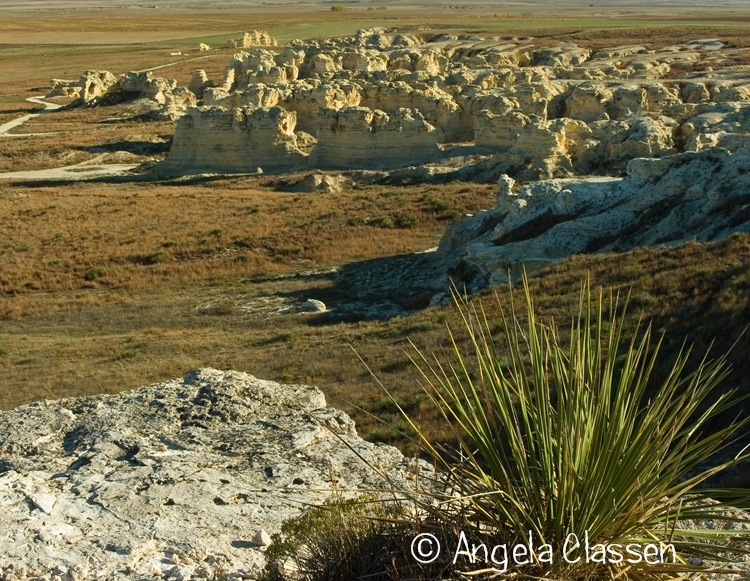 I had more fun exploring and photographing the Badlands area than Castle Rock itself. Be warned – if there have been recent rains or it looks like the skies might open up while you are exploring, DO NOT take this trip!! The roads get very, very muddy and sticky and impassible in wet conditions. Due to the remote location and scarce population, if you get stuck, you might be there for a while. Also, keep in mind this is private property and be respectful to the landowner so they will continue to let future explorers enjoy the area. Do not climb on the rocks! The chalk is very fragile and crumbles easily. Besides damaging the formations, you could damage yourself! This area is comprised of chalk deposited during the Cretaceous Period (about 80 million years ago) when it was the bottom of a vast inland sea. (Hey, who would have guessed Kansas was once seaside property?!) The sea contained multitudes of single-celled animals that fell to the sea floor, creating an ooze. This sticky material trapped and preserved remains of other animals that lived in the sea such as fish, turtles, birds, clams and various reptiles. This area has yielded numerous fossil finds, including the “fish within a fish” which is on display at the Sternberg Museum in nearby Hays. Over time, erosion has created the fantastic bluffs and formations we see today. Castle Rock stands approximately 70 feet high, although a large portion of the formation collapsed in 2001 after a summer thunderstorm. Unfortunately, I didn’t get to visit before the collapse so my photos obviously don’t show the formation at its original height. My parents provide some scale in this shot. Even now, it remains impressive. The pioneers used it as a landmark on the Butterfield Trail. In fact, stagecoach ruts can be seen to this day just north of the formation. 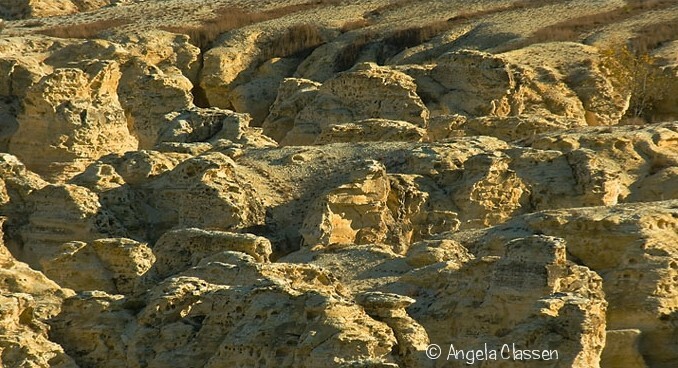 The Badlands area is a fascinating maze of hoodoos, canyons and bluffs. You could literally spend hours just wandering around in this area and getting shots of the rocks. 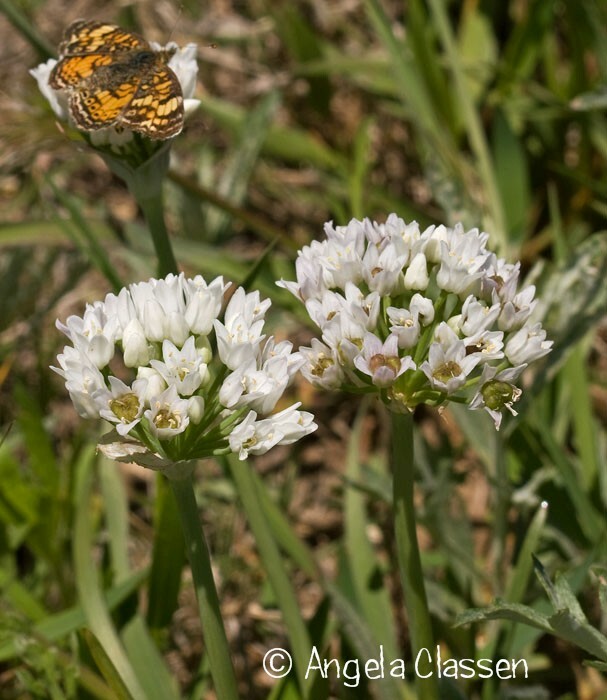 There is numerous wildlife in the area: pronghorn antelope, deer, jackrabbits, coyotes, prairie dogs, ground squirrels, and various birds of prey and other birds. Western rattlesnakes are native to the area. It’s a perfect snake heaven with all that rock and places to hide, so be very careful where you step and put your hands. 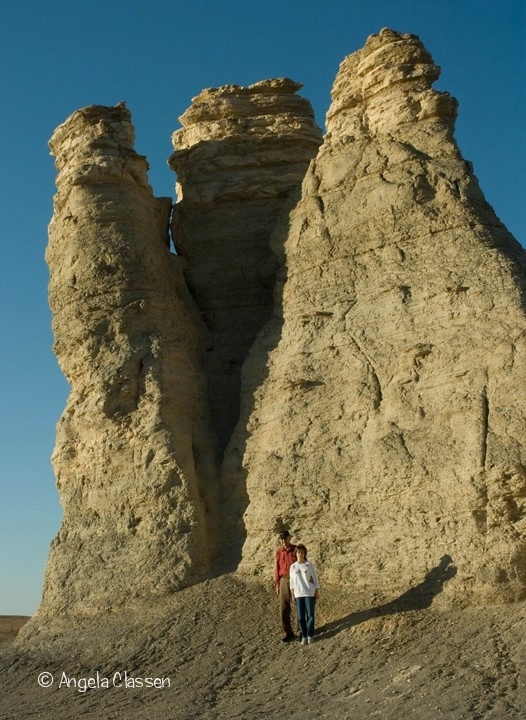 Probably the best time to photograph the formations is early morning, as the bluffs to the west tend to block the evening sun and create harsh shadows. When I visited in 2008, I was there in late afternoon and although the light was nice on Castle Rock, getting shots of the bluffs and hoodoos looking west was difficult to impossible because of the angle of the sun. Bring your full aresenal of equipment: regular lens; wide angle lens to capture the stark contrast of the vast prairie against the rugged terrain; a telephoto to zoom in on the rock formations; macro to capture wildflowers (if you happen to be there at the right time); GND and polarizing filters to help control the sky; etc. After returning to the road, you can travel east 2.8 miles to Banner Road, then turn north and follow it 12.4 miles back to I-70 at Collyer. I would love to visit this area again and spend more time exploring. It was way cool! If you are driving through western Kansas on I-70 and can spare a few hours to explore, I highly recommend this side trip. After a busy Saturday in Wichita on August 29 for my firm’s annual picnic (held at the Sedgwick Co. Zoo), on Sunday we headed to Wilson Lake for some biking & hiking. We then headed back home via the northern route (Highway 36) and stopped at a couple of sunflower fields in Washington Co. near Morrowville that fellow CSNP member Scott Bean told me about. The fields were in great condition! The rolling hills in the field combined with the sunny sunflowers to create quite a dramatic combination. When looking through the viewfinder, I just wanted to see sunflowers going into infinity and nothing else. I set my tripod up in the bed of our truck to gain extra height. I also used my 70-300 mm lens @ 300 mm to accomplish this. Although I did get some distortion on the edges, that was easily cropped out. The sun hid behind some clouds for a few minutes, which caused the light to be more diffuse and pleasing, and saturated the colors. I fired off a few shots and came away with this. Of course, the classic combination of bright yellow sunflowers against a bright blue sky couldn’t be ignored in a more intimate portrait. I liked how the petals were slightly backlit against the sky and seemed to glow. Unfortunately, these sunflowers weren’t the large variety and were planted very close together, making it impossible to get close-up individual portraits like I did last year near Beloit. The next weekend, I found out about a field in Jackson Co. just north of Holton on Highway 75. Of course, I had to visit! Again, I used our truck to give me the height advantage over the tall blooms. I liked the pattern created by the sideways sunflowers and noticed one lone flower was above the rest. This field also had an added bonus of the quintessential Kansas windmill off in the distance. The ground wasn’t quite as hilly as that in Washington Co. and those feed trucks that kept blasting by me were quite annoying, but I still enjoyed my time with my favorite flowers on earth. There are two things I can literally spend hours shooting: waterfalls and sunflowers. The Baker Wetlands are located on the south edge of Lawrence and have quite a storied history. The area is a natural wetland bordering the Wakarusa River, but over time had been drained and converted to agricultural use. The Bureau of Indian Affairs acquired portions of the property in the late 1880’s and used it for agriculture training for students at the Haskell Institute. However, the program was discontinued in 1934 and the property changed hands several times before Baker University acquired it in 1968. Restoration of the wetlands didn’t begin in earnest until the 1980’s. I’ve been wanting to visit the wetlands for quite awhile and decided to check it out this weekend. After missing the parking area off 31st Street not once but twice, I ended up parking at the east entrance on Haskell. I must admit I was somewhat disappointed in the access that was available. There was basically a dirt road bisecting the property, and a very short boardwalk at the north end, but hardly any other trails that I could see. The couple that I tried to access petered out after a few hundred yards and I was in no mood to bushwhack in a marsh, especially after my last encounter with quicksand at Kanopolis (see my previous post). There was a trail on the levee on the north end, but again, it basically ended about 100 yards from Haskell. I was really wanting closer access to the large lotus pond on the east end of the property. There were thousands of beautiful American lotus in bloom. What a sight! Unfortunately, they were too far away to photograph from the road, and with no way to get closer — I had to give up. I did find a small lotus pond just west of where I parked. Again, access was very limited. I had a clear area measuring about 20 feet where I could get right on pond’s edge, but the rest was surrounded by marsh and high grasses. I saw several aquatic plants that I haven’t identified, this beautiful white flower being one of them. The lotus plants were gorgeous! Some of the leaves/pads were nearly two feet in diameter. I saw a tiny frog hanging out on one pad, but he was in a place where I couldn’t photograph him. I was also fascinated with the seed pods. I wonder if the native Americans used them for anything? Perhaps a visit earlier in the summer would be more productive and I’d be able to find more trails. I’ll definitely put it on my “to do” list for next year! My husband was off to Eureka Springs for a mountain bike race this weekend, and I wanted to go for a hike. 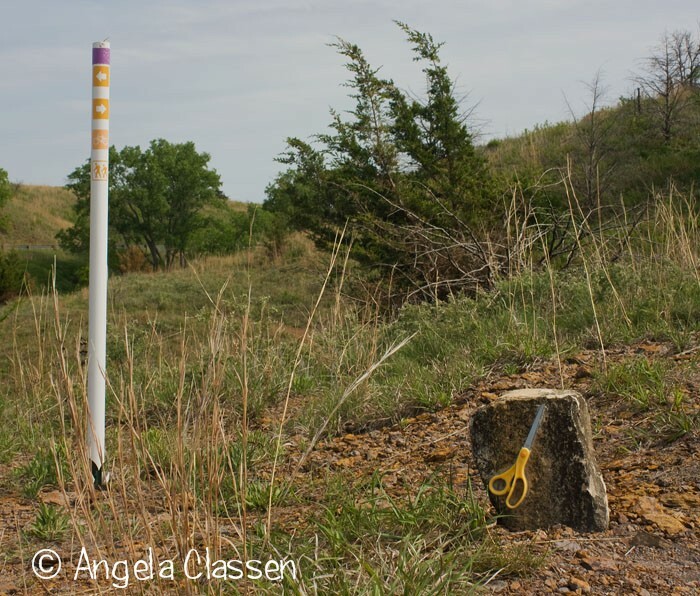 I decided to head out to the Horsethief Canyon trails at Kanopolis Lake near Salina, which is in the beautiful Smoky Hills region of north central Kansas. It was a bit of a drive, but it was a beautiful day for cruising with the stereo blasting. I loaded up the car with my gear, the obligatory road trip snacks and my iPod and headed out. I arrived at the trailhead to find no other vehicles in sight. Whoo hoo, I had the whole place to myself and could hike in quiet solitude! The weather was awesome for mid-July Kansas standards: mid 80’s, light winds and low humidity. When I attempted to hike this trail in May, I was stopped by the first deep water crossing (it didn’t help that I saw a snake swimming around in the water). The water was just as deep this time, so I went upstream about 1/4 mile and found a place where the creek was just a trickle and surrounded by what I thought was ordinary sand & mud. When I took the first step and instantly sank past my knees, I knew it wasn’t ordinary! I had found a nice patch of quicksand. I floundered around for about 5 minutes to extricate myself from the muck, looking all the time at the raccoon tracks on top of the sand. Obviously, I was a lot heavier than Mr. Raccoon… I also was painfully aware of how ALONE I was and that if I continued to sink down to China, no one would know I had been there. Finally, after 10 feet of struggling through the mire, I freed myself and fortunately didn’t lose my shoes, but I was covered from thigh to foot in dank, stinky mud. I then had to bushwhack back downstream 1/4 mile to find the marked trail. I made the decision to press on and hoped I didn’t have to deal with mud again. I found the trails a little confusing but did manage to get on the right track. The canyon area is really cool, with rocky outcroppings peeking out among the hills. Unfortunately, I ran into another water crossing but managed to find a place where I could boulder hop across. Whew!! Right past this point was a really cool spot with colorful rocks. The one on the right was covered with different colored lichens and was a nice contrast to the red sandstone above. At this point, the trail climbed for a bit and turned back to the south, where I was rewarded with a nice view of the lake. 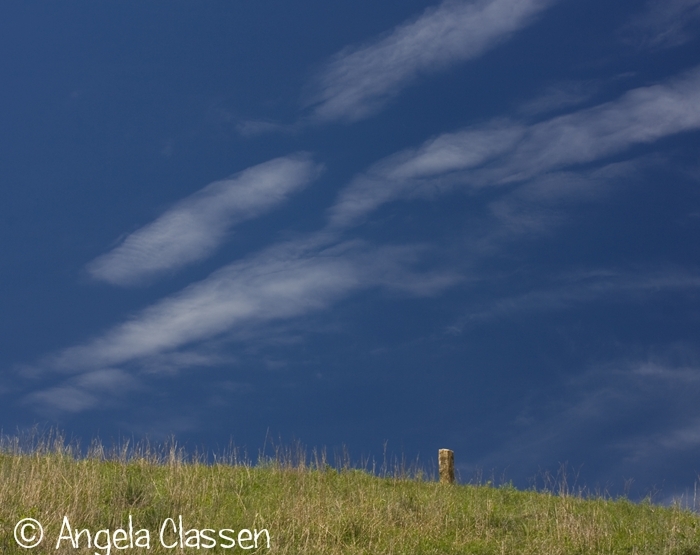 The rather wet weather we’ve had lately certainly created a lush green carpet of grass in the Smoky Hills. The color contrast between the red rocks and green grass was very pretty. I noticed when I shot this there were buzzards circling off in the distance. They were probably still looking for me down at the first water crossing! A little beyond this point, I found a spot on a hillside with a thicket of sumac and a great colorful rock outcropping. I made note of it and might return in the fall. I can imagine it would be very colorful. At this point, I decided it was time to head back to the car. I found an alternate route to cross the creek the final time, and arrived back at the car, exhausted and filthy. 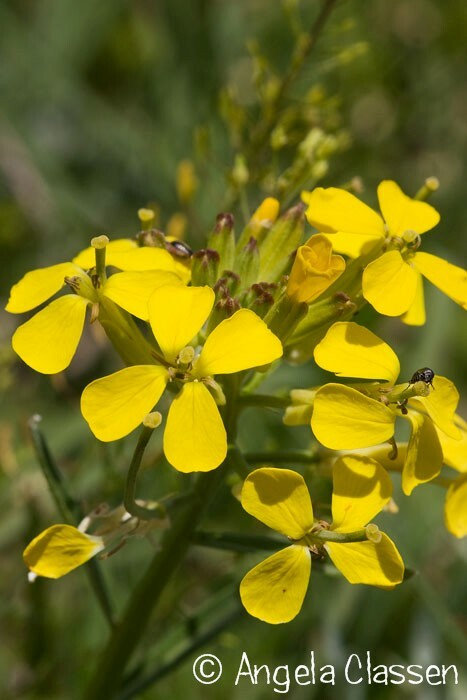 The trails were in horrible shape – in places, the trail was barely discernable, and weeds were at times waist and even chest high, completely obliterating the trail. I won’t be surprised if I break out with poison ivy/oak in a few days, and I’ve already chased a few ticks off me. Oh well, a bad day hiking and taking photos is still better than a good day at work!! 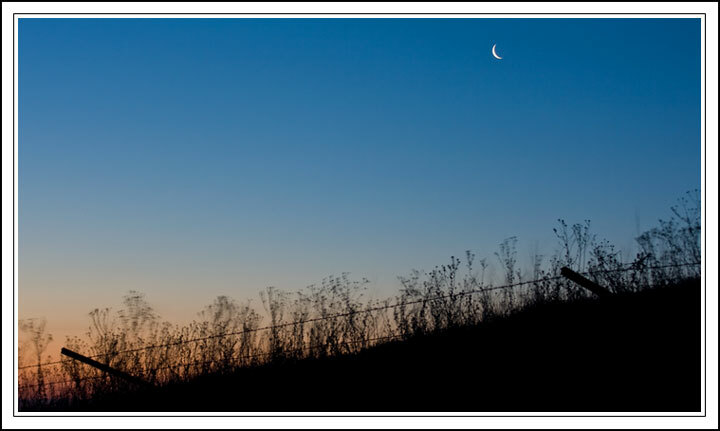 Wayne Rhodus, moderator of Central States Nature Photographers (regional chapter of Nature Photographers Network), organized a day-long shooting trip into my favorite area – the Flint Hills. We met south of Manhattan at oh dark thirty and WOW! was it a cold one! A cold front had moved through the night before and the wind was howling about 30 mph with temps in the upper teens, making for brutal wind chills. Members braving the chill were Wayne Rhodus, Scott Bean, Dena Sanders, Merle Cook, Ken Bachman, Rob Graham, Jim Walker and Jim Taylor. Our trek started on Deep Creek Road and on to Old K-18 Road. We saw lots of beautiful auburn colored, grass covered hills. And LOTS of dust! Then we headed to Pillsbury Crossing southeast of Manhattan. It had been years since I had been here and didn’t remember how beautiful the spot is. I will definitely be coming back here! 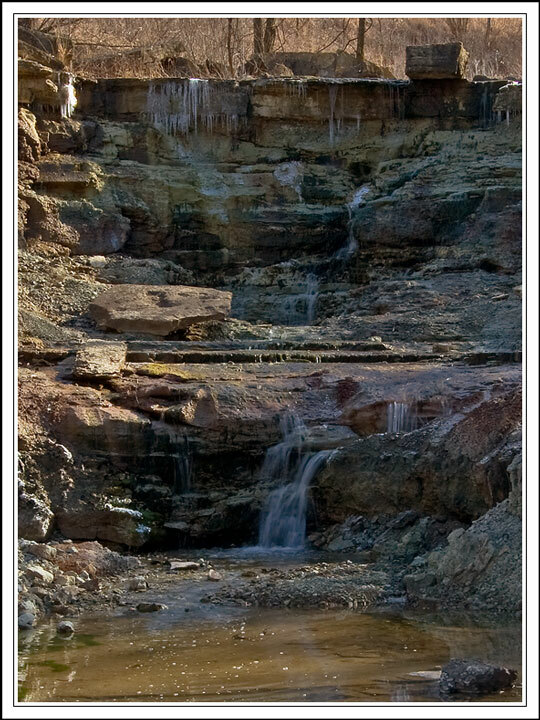 The water falling over the rocky ledge creates some very picturesque possibilities. After Pillsbury, we headed back toward Alma, drove a portion of the Skyline-Mill Creek scenic byway and hit Highway 177 headed south to Cottonwood Falls. An added bonus happened when we saw a bald eagle sitting in a tree at Council Grove Lake. We ate lunch at Emma Chase’s Cafe in downtown Cottonwood Falls and visited and got to know each other a little better. 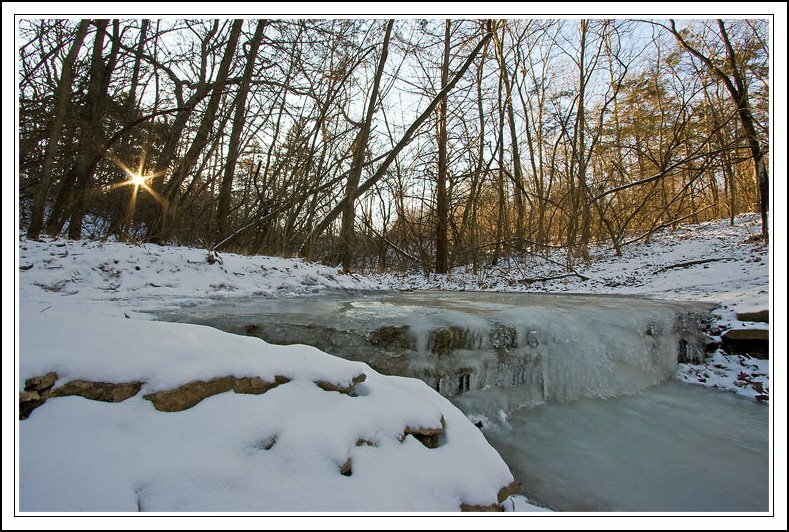 When our bellies were full and our hands thawed out, we took off for the falls at Chase Co. Fishing Lake just west of town. This is another place I had never visited. 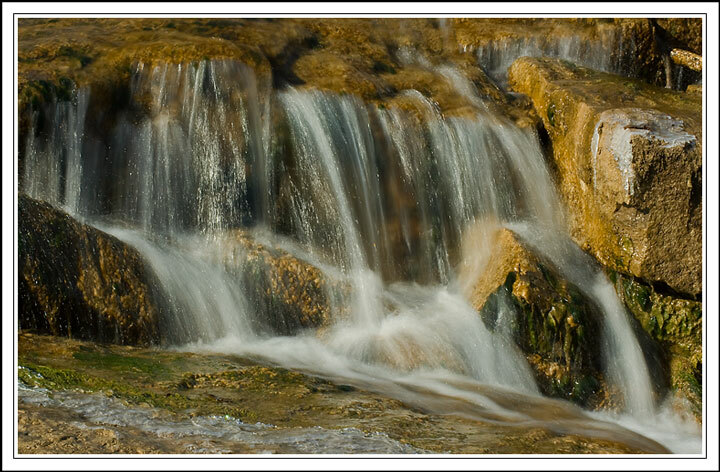 A series of small waterfalls cascade the outlet flow down the hillside, creating some wonderful spots for photos. Due to our recent dry conditions, the water was not flowing very fast on this day. Am I coming back here when the water is flowing better? You betcha!!! 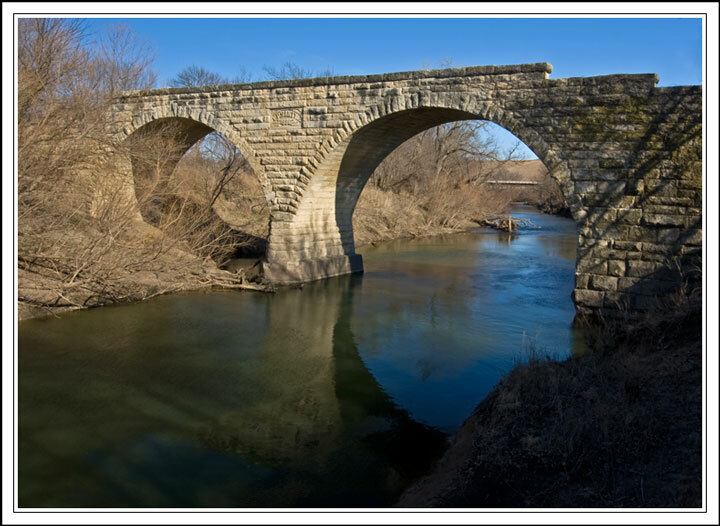 My last stop of the day was the Clements Stone Arch Bridge, west on Highway 50. It was completed in 1886 and is a beautiful structure, worthy of preservation. They sure don’t make bridges like this anymore! By this time, my energy level had drained to nothing (thanks to battling a cold) so I called it a day. Several members headed back to previously scouted locations in the Flint Hills to catch sunset shots, but it didn’t look like the Cloud Gods provided anything fun in the skies. The entire day was a great adventure and a lot of fun, and I’m looking forward to our next NPN adventure (hopefully it will be a little bit warmer)! After waiting for 19 days with no precip, we finally got another dusting (1″) of snow on the 16th! Because the temperatures overnight didn’t stay that cold and were predicted to rise into the lower 40’s the next day, I knew I had to work fast before the snow melted and the trails turned to a total mud pit, so went back out to MacLennan Park at sunrise on the 17th. I finally got to play a little with my new Canon 10-22 mm lens. At 10 mm there is some distortion, but sometimes that’s a good thing. 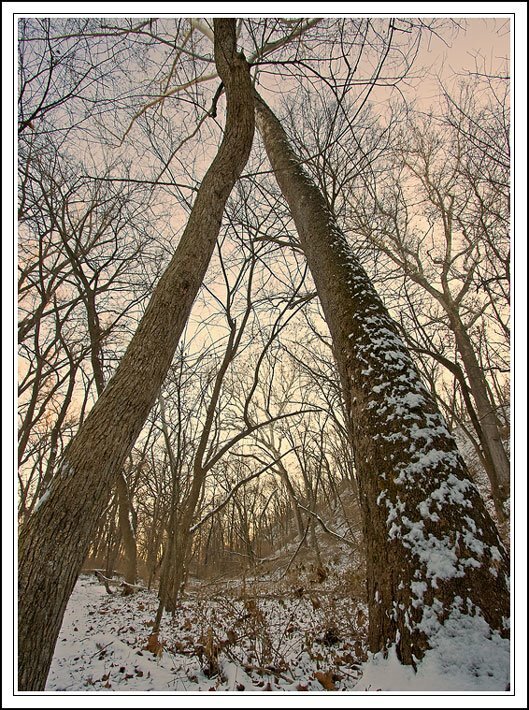 It lends an interesting effect to tall trees. Last weekend, I started my lens testing procedure and finished all test shots for the 10-22. Unfortunately, I didn’t have time to review all the images but after looking at a few, it was no surprise that the sharpest apertures were in the mid-range and not at the largest or smallest settings. With this shot, for example, I wanted to capture the starburst so used the smallest aperture at 10mm (F22). When comparing this shot with another shot at F14, it was very evident the sharpness of the lens fell way off. I hope to finish my lens testing the next few weeks and be able to label my lenses with which apertures are the sharpest. I also purchased a hyperfocal chart and hope to use this to improve the sharpness of my images. Through trial and error, I’ve been using different sharpening techniques for images I post to the web. So far, the technique that Marc Adamus (member of Nature Photographers Network) uses seems to work fairly well. I’ll keep working on it! Since I’m a self-taught photographer, I’m used to the trial and error method of learning. There are certainly a lot of resources at my disposal, and membership in NPN has been one of the best things I’ve done to improve my photography skills. NPN has many talented folks who never seem to mind sharing their opinions and techniques. Just viewing the images of these talented photographers has made me look at my own work much more critically and see flaws that I wouldn’t have noticed a couple of years ago, and makes me want to improve my techniques. After getting the big scene, I got some more intimate shots of the falls with my 70-300 lens. I’ve never been a big fan of winter, but now that I’ve been out a few times with my camera, I’m starting to develop a different attitude. The snow makes everything look fresh, pure and beautiful. The air is clean and crisp. 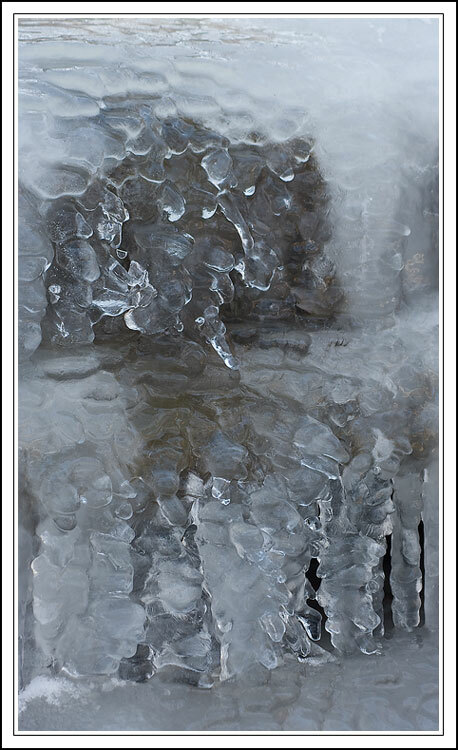 There is a peacefulness and serenity not present during other seasons. I really enjoyed my 4 mile hike, and I’m hoping for yet more snow SOON! MacLennan Park certainly has some beautiful places to explore.